King Benjamin’s address found in Mosiah 2-5 is one of the most treasured passages in LDS scripture. I have enjoyed diving into this and studying it in depth in preparation for Gospel Doctrine lessons 15 “Eternally Indebted to Your Heavenly Father” and 16 “Ye Shall Be Called the Children of Christ”. One of my favorite topics is Book of Mormon historicity. But another favorite topic is how much I love the Book of Mormon for its truth and beauty. This article will go into both of these topics. Is King Benjamin’s address modern? This passage was one of the very first identified by Book of Mormon critics as having obviously modern influence. As Richard Bushman stated, even faithful LDS are adopting this view more and more frequently. When the Book of Mormon was first published, this passage stuck out to people in Joseph Smith’s day as resembling a Protestant revival camp meeting. 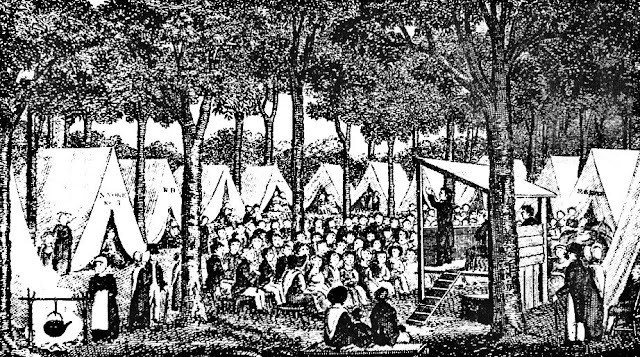 Camp meetings were popular in early 1800’s America, especially in frontier areas (ie western New York) that were not heavily populated with many churches and preachers. A preacher would travel to the location and hold a series of intense sermons and worship sessions over a few days. Camp meeting revivals were so common in New York and the surrounding areas the leading revivalist and theologian Charles Finney coined the term “burned over district” because no one was left to convert. In the Book of Mormon, they gathered at the temple. 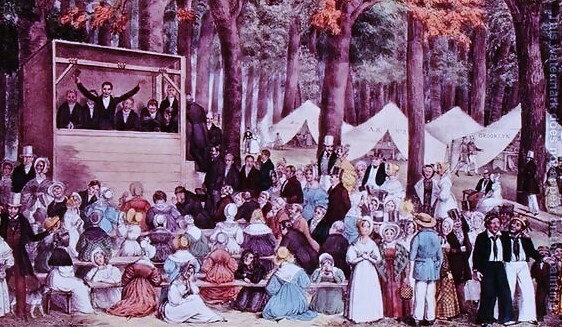 A revival hosted by Bishop William M’kendree in 1826 in New York where attenders pitched their tents facing the raised stand, referred to the camp as God’s temple. A prolonged worship session that lasted several days or mores. Purpose was to teach atonement of Christ, the need for a Savior, and call sinners to repentance. In addition to the correlation to 1800’s revivals, another point for this being a modern work is the very specific, modern era Christian doctrine taught. In a previous article, I talk about how it’s a bit unrealistic to see such mature Christian arguments in the Book of Mormon. These arguments sound exactly like they did in Joseph Smith’s era, after Christianity had matured through the early Christian period, Pelagianism, Catholic period, the Protestant Revolution, and the debates of Calvinism and Arminianism that led to the state of American Protestant Christianity in Joseph’s day. The Book of Mormon enters the debate exactly at this advanced state. Even the apostles of Jesus who learned the gospel directly from Him did not teach with any level of clarity on these subjects in the Bible. These doctrines developed over time, like all human thought does: building on previous body of work, arguing, debating, expanding it, and then arguing over those expansions, etc. Is King Benjamin’s address ancient? Many LDS scholars have pointed to correlations between King Benjamin’s address and ancient Israelite customs. Taylor Halverson summarized these points in an article in the Mormon Interpreter. He lists the six patterns evident in this passage that BYU professor Stephen Ricks outlined as correlations to ancient Israel. Halverson adds another important one. The plea for the covenant and atonement found in Mosiah 4:1-3. Kevin Christensen frequently cites non-LDS scholar Margaret Barker, and argues that content in the New Testament and Old Testament has been removed, that otherwise would correlate strongly with LDS style temple ceremonies and covenant making. He sees the Book of Mormon as being chock full of these references, most notably in the passage of King Benjamin’s address. LDS scholars argue that King Benjamin’s address and focus on temple and covenant making has more parallels with the Old Testament than the modern era. Compare the covenant of Jeremiah’s people and King Benjamin’s. FairMormon makes a case that the camp meetings in Joseph’s location would have occurred when he was very young or later after the Book of Mormon was published, and he likely would have had no first hand experience with them. Additionally, there are many aspects of camp meetings that don’t correlate with King Benjamin’s address, especially the singing of hymns which were primary in importance in camp meetings and don’t make an appearance in the BOM account. Also, important in camp meetings and absent in King Benjamin’s address were exotic spiritual manifestations like speaking in tongues, faintings, erratic head movements, etc. LDS scholar Blake Ostler takes an interesting position where he acknowledges both modern and ancient content. I wrote about this in a prior blog article on Book of Mormon anachronisms. A good example of this is King Benjamin’s address found in Mosiah 2-5. Ostler sees modern elements of Joseph’s environment, such as 19th century revival meeting similarities, camping in tents for several days, call to repent and accept Christ, attenders would experience change of heart, etc. But he also sees distinctly ancient elements: call for entire nation to gather to witness coronation of king, burnt offerings, covenant renewal, etc. He believes traditional LDS apologists are unable to sufficiently explain the modern elements, but critics are unable to explain for the complexity and ancient elements in ways that are “above Joseph”. The only sufficient explanation is to combine the two, using his Expansion Theory. I side with the LDS scholars that Richard Bushman references as believing the Book of Mormon to be an inspired work but most likely not correlating to an ancient text. A beautiful definition of scripture and revelation I first heard from Blake Ostler is the “synthesis of the creativity of man responding to divine persuasion”. I believe it’s very likely the 1800’s camp meeting revivals were in Joseph’s subconscious mind as he responded to divine persuasion and produced this beautiful passage of scripture. I find the passage both beautiful and complex. Regardless of whether you believe this passage is 100% ancient, 100% modern, or somewhere in between, believing Mormons agree that King Benjamin’s address ranks as one of the most important sermons in all of scripture. Interesting and profound logic of why we stay indebted to God. 1) He gave us life 2) If we attempt to repay him through service, he immediately blesses us, keeping us in debt. Mosiah 2:41 Excellent verse outlining “practical religion”. Living the commandments of God results in a state of being where one can be happy and feel blessed. A natural state of the consequences of good decisions and choices in our lives. Mosiah 3:5-11. Beautiful passage talking about the condescension of God, similar to Nephi’s view of it 1 Ne 11. We don’t always emphasize this aspect of the life of Jesus as God coming to Earth to experience it as a man. He really did suffer human emotion, discomfort, and pain. Natural man is an enemy to God. What does it mean for the natural man to be an enemy to God? I think the natural man is an enemy to godliness in the sense that it’s not always our natural default state. Without exerting discipline over our natural state, our bodies tend to want to sleep too much, be a little lazy, have sexual desires that are not the best for us, crave food that’s not best for us, we’re naturally selfish and jealous and gossipy and, we’re prone to anger. 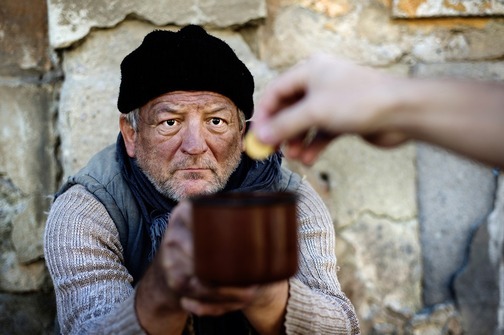 Godliness is to master our physical desires and to be selfless and serving and good to other people. How do we move from that natural state to that godly state? Become as a child, humble, patient, full of love, willing to submit to God’s will. A sister in a former ward told this story. I was out shopping with my husband and 9 year old son. As we checked out, my son threw in a piece of candy. Just a cheap little 15 cent sucker or something. My husband looked at him and without expression on his face, just shook his head and said no. I didn’t understand what was going on. I interjected, “just let him, it’s no big deal”. He didn’t answer, just shook his head. I turned to see if my son was feeling crushed over this, but he had already turned around to walk back to take the sucker back. What’s going on here? Why wasn’t he fighting back or whining or complaining? My boy came back and he seemed to be taking it just fine. OK, I’ll let it go. So, we get in the car and we’re driving, and I ask him again, “I don’t understand what just happened, that was so weird.” It was right then, my husband turned the car into Krispy Kreme donuts. Yay. Krispy Kreme donuts for everyone. My son was elated. But he didn’t seem surprised. There was some kind of unspoken communication here. When the father told the son no, there seemed to be an understanding that the only reason he was saying no was that there was something bigger and better on the horizon. The son submitted to the will of the father in perfect submissiveness, meekness, humility, and patience, trusting him to meet his needs and wants. Now that he’s outlined what God does for us, he’s going to outline what God expects from us. He’s about ready to put the people in a covenant, and he’s defining what will be their part. King Benjamin seems to intentionally stack the deck, making it impossible to keep our end of this. But at the same time, he gives a very grace centered message to soften the blow of how difficult this may seem. That’s a very gentle way to remind us that we’re not perfect, we’re going to make mistakes, we’re not going to go as fast as we probably want to. Stephen Robinson in Believing Christ gives the Parable of the Weightlifting Spotter to give insight into this idea of how we seem to have so many commandments that it’s impossible to obey them all, seemingly driving some into guilt and fear. A person goes to lift weights. He puts on enough weight to do about 10 repetitions. But he’s never done 10 before. He wants to push his muscles to the brink, because he knows that is the way to grow his muscles. His spotter is there to help him if he can’t make it. He does seven reps. On the 8th he falters. The spotter says “push it, you can do it, one more”. He gets up the 8th rep on his own with no help! He wants to quit, but the spotter says “one more you can do it”. He attempts the ninth but can’t. The spotter pulls up the weight to help him and he gets it. “One more” the spotter cries out. So, exhausted, he takes the weight down and attempts to push it up. The spotter has to lift most of the weight this time, but he gets it up. The weight lifter failed in his attempt to lift 10 reps on his own. But he doesn’t go home and guilt himself to death “I wasn’t able to do 10 reps, I’m such a loser, I’ll never make it to heaven.” No, he is proud of his effort and knows the growth that will come due to his effort, even if he didn’t make the 10 reps himself. Mosiah 4:17-22 King Benjamin expands on the Parable of the Talents, going deeper into the comparison of man to beggar in a power position to man to God in a weak position. This is something the Book of Mormon does over and over. It will take a passage from the Bible and expand on it. By carefully comparing the Bible version to the Book of Mormon expansion, we see what doctrinal emphasis and insight the Book of Mormon is giving us. God cares about not just our needs but our wants. He is a good God. At the end of this sermon, the people are convinced of the message and desire to enter into a covenant, to take on the name of Christ and be his people. What is the point of this covenant? It is for King Benjamin’s people to have Christ in their hearts. The whole purpose of King Benjamin’s address seems to come down to this thing about our hearts. Having him in our hearts and us in his heart. In addition to the doctrinal beauty and inspiration, I find some very interesting complexity to this. I don’t go so far as to say Book of Mormon complexity proves that it couldn’t have been created by Joseph Smith (creativity of man responding to divine persuasion). But it’s enough to give me pause from time to time. Many LDS authors and scholars have pointed at complexity in this passage. Here are some of the highlights of that list. 2. Some very profound commentary on modern U.S. politics, both from a conservative perspective (Mosiah 2 talking about political leaders not taking payment and keeping taxes low) and from a very liberal perspective (Mosiah 4 a very Socialistic view of community, taking care of all beggars and reducing poverty). 4. Michael Barker also makes note of the use of other poetic structures, for example. 4:4 “My friends and my brethren, my kindred and my people” This is an interesting sentence structure. It goes from non-familial to familial, then back to familial followed by non-familial. 5. Textual phrases. We see both the drawing on of powerful phrases already given in what would have been popular sermons of Nephite history “goodness of God” drawing from 2 Ne 9. And also from Michael Barker, the creation of phrases that go onto become part of the Nephite prophet vocabulary, ie “change of heart”. See Alma 5:7, 12, 13, 14, 25; 19:33; Helaman 15:7. 6. A complex review and summary of the Christian doctrines of grace, atonement, and obedience available at the time of Joseph Smith, but bringing them together in a new, unique offering. 7. King Benjamin was the king over two distinct groups: Nephites and Mulekites. His message seems to have this subtext of racial tension and economic disparity as the backdrop. The message has a very strong ring of community togetherness, acceptance, and cooperation. This would be a good model for race relations in the modern world. Whether you think Joseph Smith made this up with no inspiration, or you think it’s an ancient text translated by Joseph, or you think it’s scripture produced through the mind of Joseph with no ancient text, or some combination, I hope we can appreciate this passage for the beauty and inspirational messages.